CATALUÑA still lacks a government but now has a Parliament plus a Speaker and Mesa to regulate its day-to-day running. 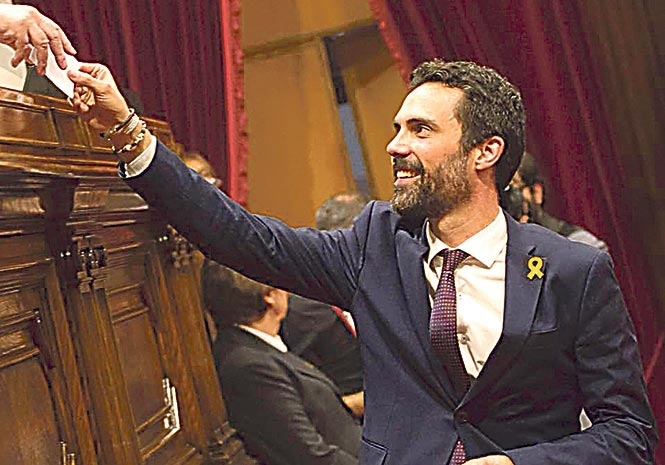 Unsurprisingly the Speaker, Roger Torrent, and the majority of the Mesa are pro-independence. Ciudanos was the most-voted party last December but is outnumbered in parliament by ex-president Carles Puigdemont’s JxC, ERC and CUP. Despite missing votes from Puigdemont who is self-exiled in Brussels with members of his former government, the secessionists pulled it off thanks to the Cataluña en Comun-Podemos tandem. Like the girl in the song, they never say yes and never say no to independence and this time did just that by casting blank ballots. Torrent, an MP for ERC, declared that despite his pro-independence convictions he respected the cross-sections in Catalan society and would do his best to defuse conflict. Meanwhile pro-independence MPs are clamouring to vote on allowing Puigdemont to be installed as regional president via videolink. Torrent and the Mesa have the nice job of deciding whether this can be done, which should not be too difficult as the Parliament’s regulatory committee have already pronounced it unfeasible. Far from defusing conflict Torrent will be plunged into it, with a lot of it coming from his own side. CARLES PUIGDEMONT’S old party PDeCat was once Artur Mas’s old party and before that it was Jordi Pujol’s. The last two politicians were on the make with kickbacks, commissions and padded invoices that were nice little earners for them and for party funds. Unfortunately for Puigdemont & Co the courts have ordered PDeCat to pay back €6.6 million ‘earned’ through government contracts. As though this hole in their finances weren’t enough, the stench of corruption could sour relations with ERC, the other pro-secession party which proudly claims never to have dipped into the cashbox in its 87 years of existence. Nevertheless, such admirable probity did not extend to using public money to fund the October 1 referendum, which is one reason why ERC leader Oriol Junqueras is currently remanded. Junqueras describes himself a regular churchgoer and presumably is at home with the Jesuitical maxim that the end justifies the means. IF there were a general election tomorrow, Ciudadanos would win it. More than half the people who voted for Mariano Rajoy and the Partido Popular would not do so again, they told a Metroscopia poll. Rajoy failed to get an overall majority in December 2015 or June 2016 because PP voters alone have never won him an election, as March 2004 and 2008 demonstrated. He only pulled it off in 2011 because voters with no strong party allegiance believed he could reverse the economic crisis. Corruption and Cataluña have taken their toll since then, and those floating voters have decided to swim instead and they’re heading off to Ciudadanos. THE Partido Popular and the PSOE are reluctant to comply with the European Council’s call to de-politicise the General Judiciary Council (CGPJ). This body controls and regulates Spain’s judges and both parties want to continue choosing 12 of the CGPJ’s members. Meanwhile the European Council reminded Spain that its Constitution requires the Lower House to name four CGPJ members, the Senate another four and the judges the rest. It might not be ideal and could make the legal system a closed shop. But is it democratically healthy if the lawmakers appoint the men and women who judge the judges?